It is possible to repair almost any tub. From patching a chip and matching/blending the area to more extensive repairs such as the one above. This drain was sanded out and the holes were filled with spray foam to support the repair. Then metal filler was added and polyester filler applied to smooth out the repair. 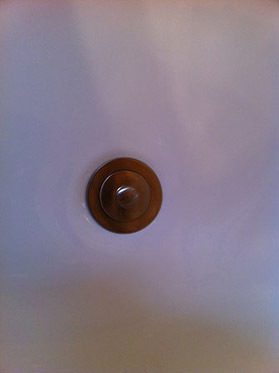 A Watco Drain and Overflow kit was then installed after the tub was refinished. 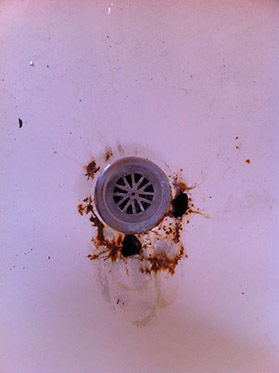 Don’t assume your rusted out drain has gone too far. We have repaired drains where there is zero metal surrounding the plumbing. Edmond Bathtub Refinishing also repairs holes and cracks in fiberglass and cultured marble tubs. The process is similar. The crack is stop drilled on the ends, supported underneath with sprayfoam, floated out and finished smooth with polyester glaze and then color-matched and re-surfaced. The process takes about one-half of a day. 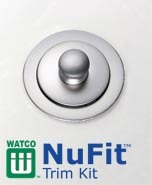 Watco drain and overflow kits are an inexpensive way to fully dress out your newly refinished tub. No plumbing removal is required. The drain kit epoxies over the existing drain.